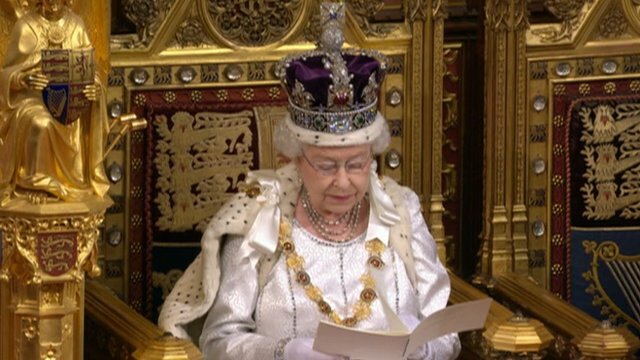 Very confused today as I thought the Queen's speech was something to do with the Leveson enquiry. Turns out it isn't. What is it then? Well it is an opportunity for Clegg and Cameron to delight us all with their ideas for lots of lovely new laws for the Country to come in the next year or so. Great, we all want more laws don't we, can;t have enough of them? Being a Coalition the technical term for the proposed legislation is a "bugger's muddle." A few attempts at trying to reform the economy, liberally hidden within a miasma of crazy Lib Dem wish fulfilment (Lord's reform), appealing to single interest pleading lobbies (Small donations bill, groceries bill) and the odd sensible reform around Children in Care. Comprehensive it is, cohesive it is not. having said that some serious bills are there around reforming public sector pensions - controversial the BBC manages to get in there. As if somehow sane money management is controversial (actually at the BBC maybe they have problems on this issue....). Finally having the Banking bill is a good thing though, the faster the banks are de-toxified the better for the economy. More depressing are the energy and utility bills which again seemed to be aimed at making anything sensible more difficult whilst at the same time further promoting the hopeless (Nuclear Industry) and the failing (Green investment). This latter piece is the most worrying, the Country faces an urgent energy crisis as my well informed co-blogger Nick Drew has been writing about for years - yet the Tories seem to be happy to cede ground to Lib Dem fantasies about the Green world, probably because Cameron himself buys into this thinking. Two things are in the future which are going to bring down this Government or the next - Spain's Euro exit and Power cuts in the UK. As the days tick by, both these events move inexorably closer. Building more nuclear power stations is the way to avoid power cuts. Nuclear power is safe, reliable and ultra-low carbon. I think Cameron is the sort of man that thinks the phrase "I am from the government and I'm here to help you" is a statement of fact, rather than a joke in poor taste. That being so why is he the leader of the Tory party? I think all the deluded Tory faithful who encouraged us to vote for him should confess their shame. What could he say? He's attacked for tax cuts and rises? His only hope is an EU referendum. He can leave it until 2014 1/2. By then no one will care what the Lib Dems think. An energy crisis is serious and being ignored. That winds me up. Beed you make the point well, criticised for tax rises and cuts - without the rises he would have had half the criticism. On the bright side we could always start digging up coal again, and then burning it in powerstations. ... another return the the 70s where the lights did not stay on all the time. Off topic - whats up with EMED, or is it just the general risk-off ? CU, Andrew: As we are right now mothballing 1990s gas power plants as we have too much generating plant for the reduced recession demand, don't think we have to worry about lights out in the short term. The Centrica MD is wingeing that "as much as 6,500 megawatts of additional gas-fired capacity will have been added to the system over 2011 and 2012" causing his slightly less efficient 1990s gas plants to become uneconomic. This "lights out" storyline is more complex than is often portrayed on the blogs. For some serious Timera Energy analysis check this out. On the 2020 time horizon more gas plant is retiring than coal+nuclear. Seems to me we will get sufficeint new or modernised-1990s gas plant built on a "just in time basis". Lights out isn't the issue, but the future price of leccy is. who is the minister in charge of keeping dometic homes alighjt and heated? Laban - re EMED - general market woe. My understanding is the Ministry in madrid has all the docs it needs to come in an override the local Junta now and formally approve. Clearly another political hurdle, of the many over the years, but actually not so bad now.